A few weeks ago, a fire at the 200-year-old Museu Nacional in Rio de Janeiro, Brazil, obliterated years of Latin American history, science, and culture. Investigations revealed the extent of disrepair the museum had experienced, stemming from a lack of government funding over the past few years. Multiple news outlets reported on the museum’s use of crowdfunding to pay for expenses and lack of digitized records. A public museum, this spurred international outcries over budget cuts experienced by public museums, libraries, and archives worldwide. As a nonprofit museum, the news spread through our office like when there are pastries in the breakroom. I learned that because our museum is situated close to train tracks we have a policy in place in case a train runs off its tracks into our building. As I led tours through the galleries, I started noticing those little white doors cut into the wall that hide fire extinguishers and the sprinklers mounted inconspicuously into the ceiling of our Early Learning Center. I started to think about the collection at FWMoA, what would be lost for the residents of Fort Wayne, and Indiana at large, if our museum was there one day and gone the next. As an art museum that collects, predominantly, American and Regional art, we don’t have the 12,000 year old skeleton and oldest fossil in America. We don’t have frescoes from Pompeii or a meteorite. Not only was Latin American history destroyed, but world history, world science, and world culture. In this globalized economy, we are no longer isolated to our own little histories and museums play a role in exposing their communities to unknown lands through the use of objects. Even within our own collection we stray outside the boundaries, as quite a few of our exhibitions have included artists from around the world: The National: Best Contemporary Photography, Kirsty Mitchell’s Wonderland, and the annual International Glass Exhibition. The fire in Brazil got many groups talking about disaster preparedness, museum safety, and the digitization of records. As an educator, my job is predicated on having physical objects to present to students. Therefore, it got the education department here at FWMoA thinking about our museum with no art on the walls, no objects in the space. 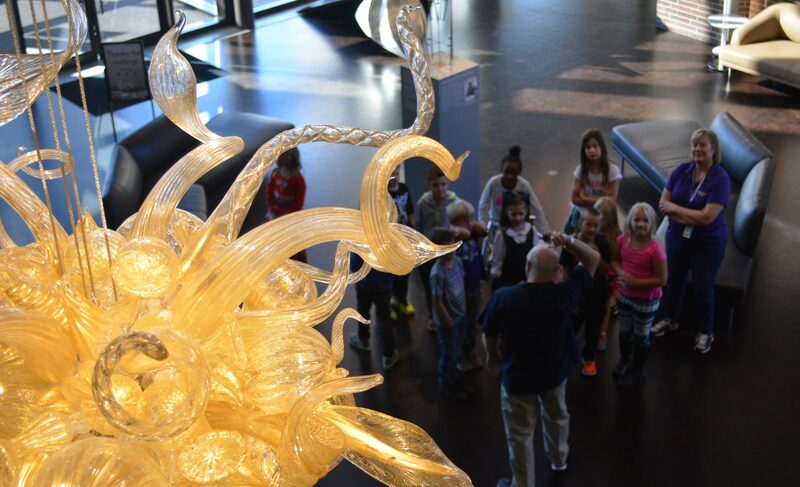 On a tour, students learn the process of glass casting. What would happen if this glass piece melted in a fire? Teachers bring their students to museums to experience “the real thing”. Thanks to digital projects like Google Arts and Culture, anyone with a decent Internet connection can walk the halls of the Louvre and stare at the Mona Lisa. It isn’t until you actually slowly plod behind a large group of tourists with iPads down the halls of the Louvre and fight the crowd to see the Mona Lisa that you realize how small the painting is. Perhaps you find yourself a bit disappointed at the size and how the colors have dulled. Or maybe you are able to get closer and see details you missed onscreen, like the river that flows nowhere. Sharing a space with a large group of people and a small painting affects the way you view it. Looking at an object in real life cannot be replicated, and a 3D version is not the same as seeing the real thing that people touched 200 years ago. There is a reverence to viewing the real Starry Night, for example, which cannot be replicated on a screen. Objects are eyes into the past but also inform the present. Here at FWMoA, Chuck Sperry’s work, currently on display, pulls from 19th century poster artists like Henri de Toulouse-Lautrec. Indiana Impressionist art tells the story of a worldwide movement on a regional scale. Amish quilts create a window into an isolated community, showing how even inclusive societies are impacted by global events. Without knowledge of its predecessors, the work of today loses its familiarity and it becomes harder for connections to be made. The fire at the museum in Brazil confronts us with our own mission, that of preserving and presenting physical objects to audiences. Without the objects, or the artworks, how can we hope to fulfill our promise? The United States, if we consider the signing of the Declaration of Independence as the start of our history, is 242 years old. Admitted to the Union as a state in 1816, Indiana is only 202 years old. Brazil, however, is 517 years old. Without our current artworks to look back on, I wonder what art and the study of American Art would look like in 300 years. How would museum educators teach a blank gallery? While I agree with numerous other voices that museum professionals should invest time and energy into disaster plans, I hope the community these museums reside in will also take a moment and consider what it would be like without them. Just as museums showed us a few months ago what gallery walls would look like without immigrants, think about what your community would look like without a museum. What would our history look like without its objects? Haven’t been to FWMoA yet this fall? Come visit us Tuesday-Sunday, with extended free hours Thursday nights!